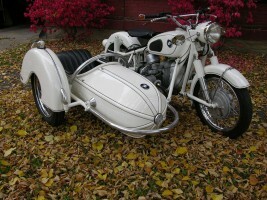 This bike came to me as a pair. 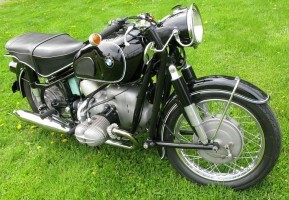 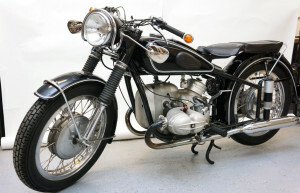 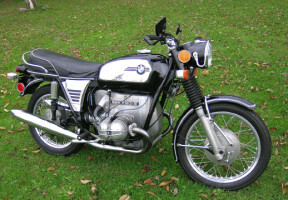 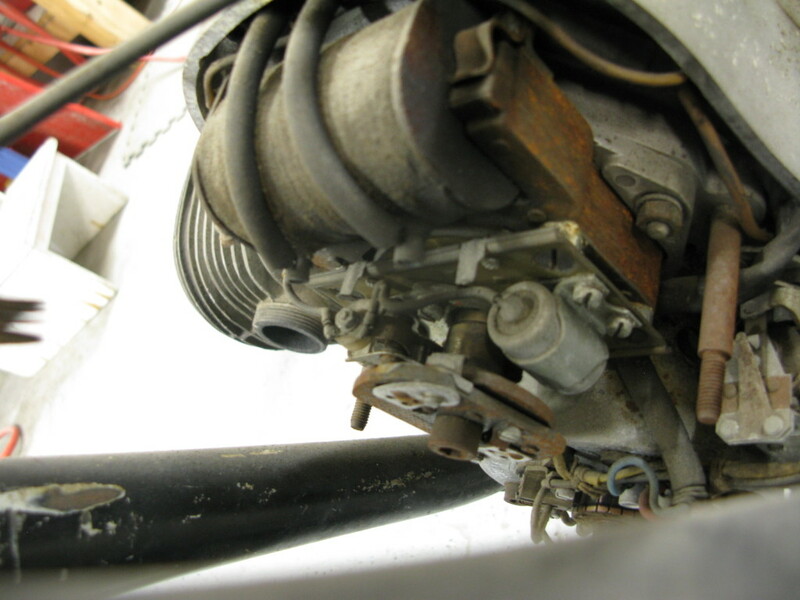 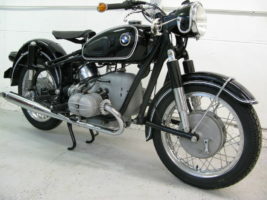 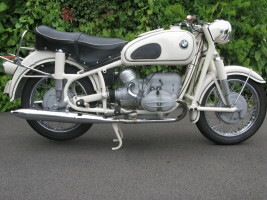 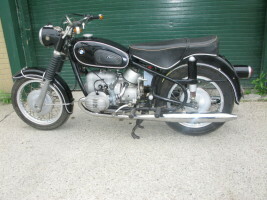 This a 1966 and the other R50/2 a 1964. 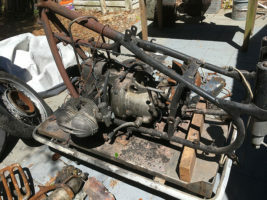 The original owner before the person I purchased them from had planned to restore this bike and use the other for parts. 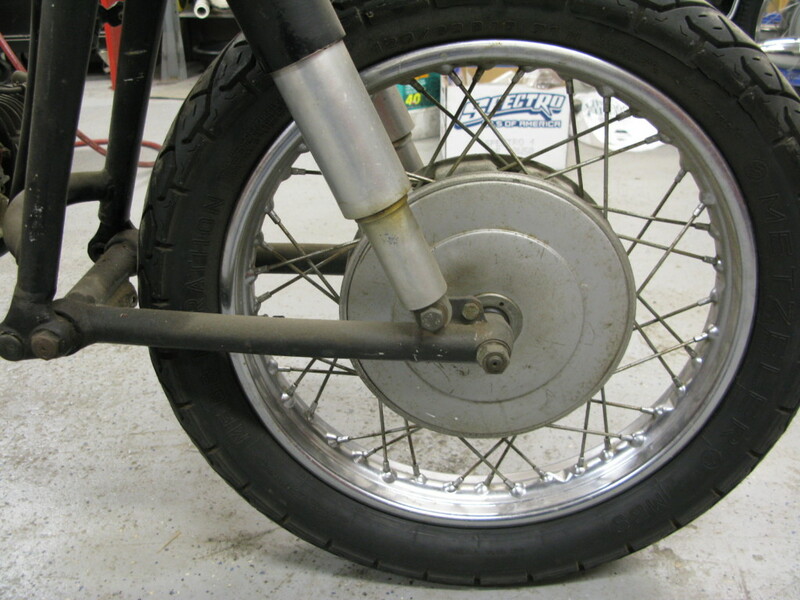 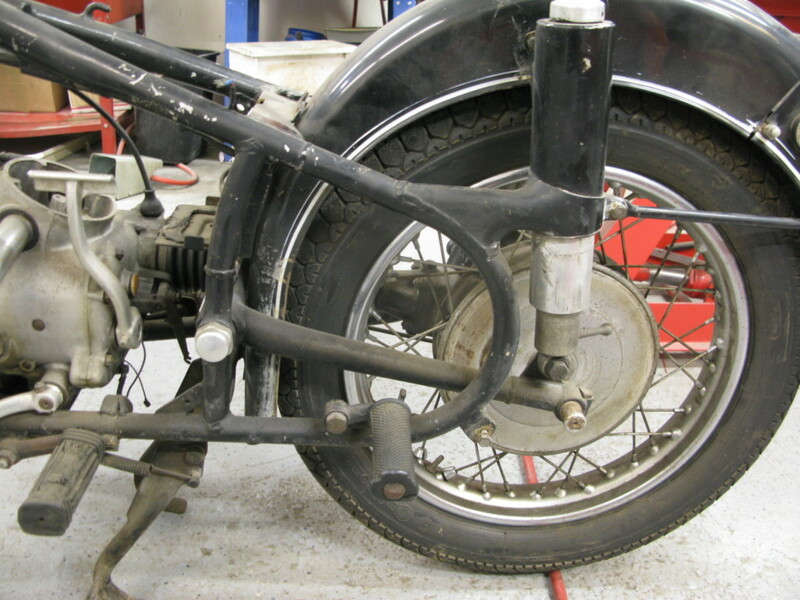 This bike was a rolling chassis but not all there or all usable. 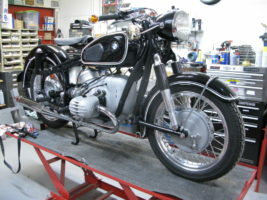 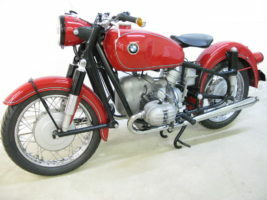 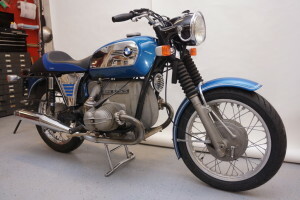 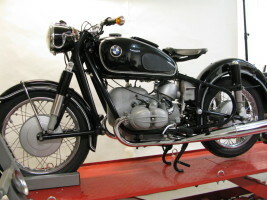 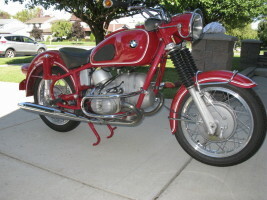 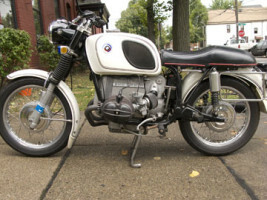 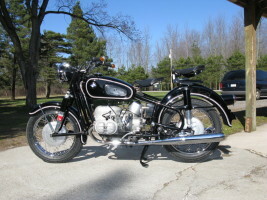 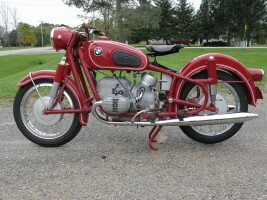 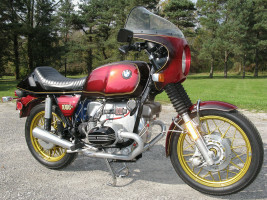 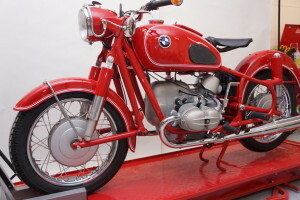 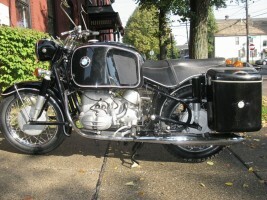 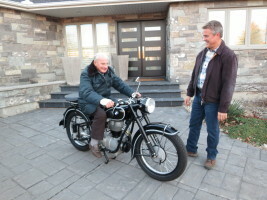 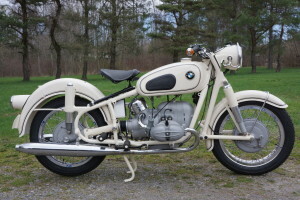 Glenn from the Beemer Barn and I purchased both projects and decided we could restore both. 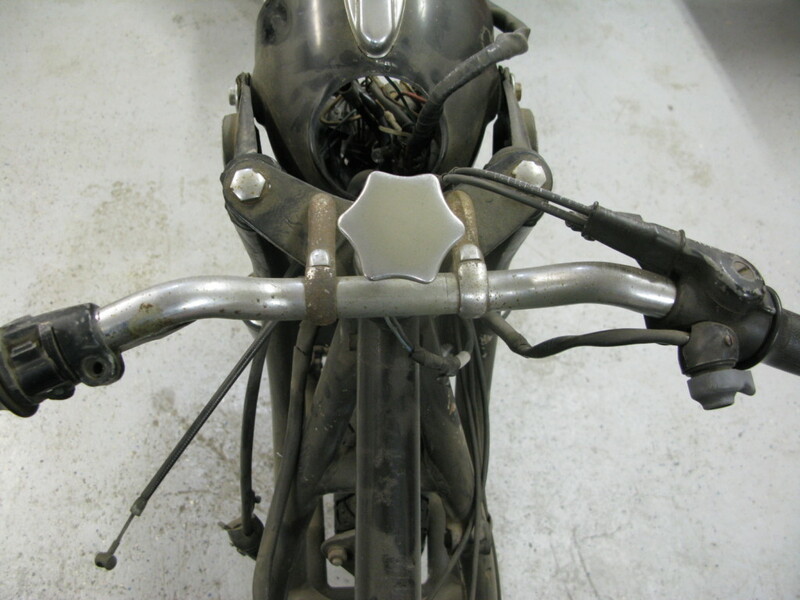 We immediately began to dismantle and inventory both bikes. 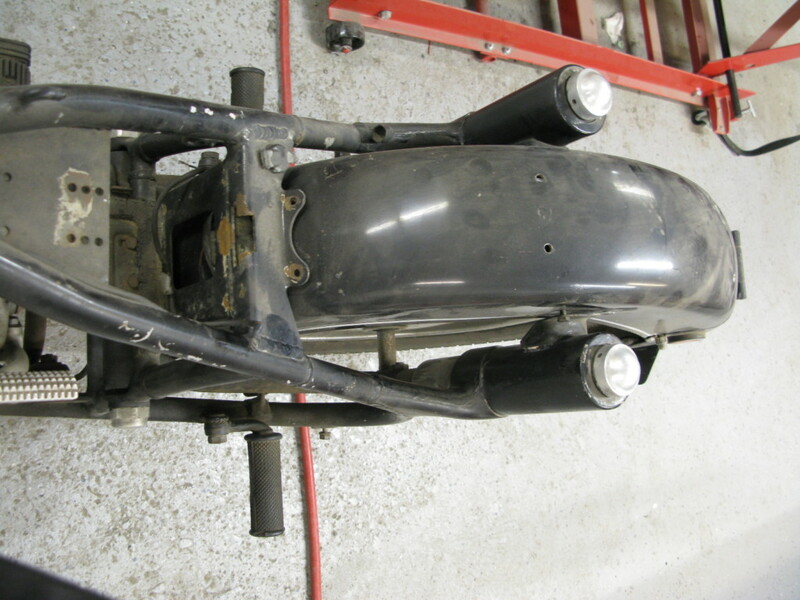 All parts on this bike were evaluated and solvent cleaned so we could see exactly what we had to work with and what would be needed. 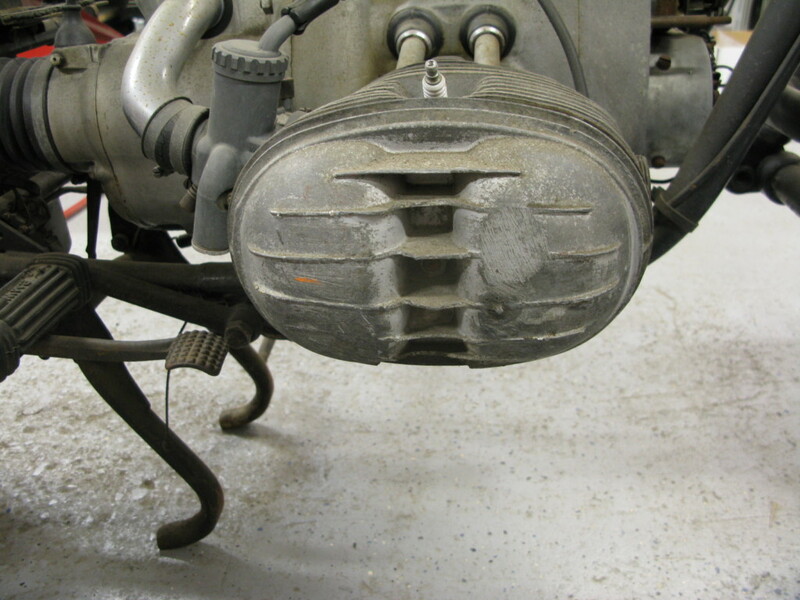 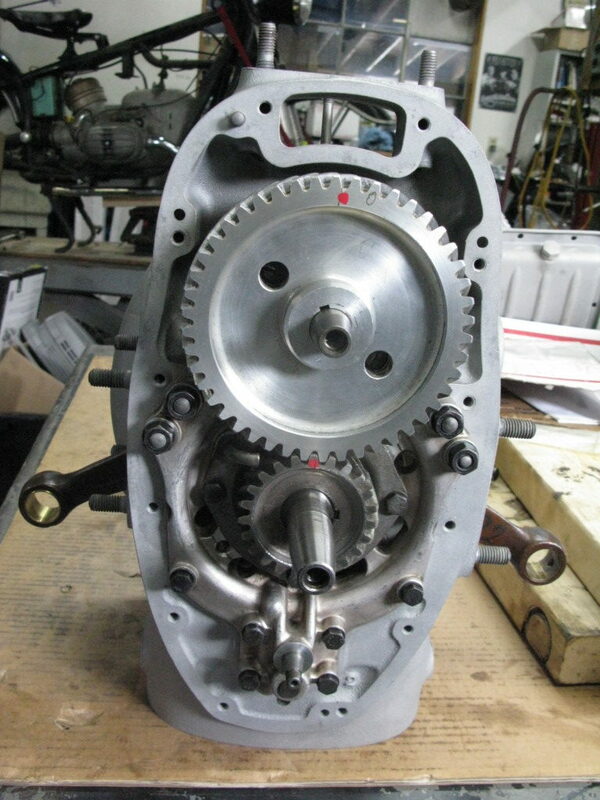 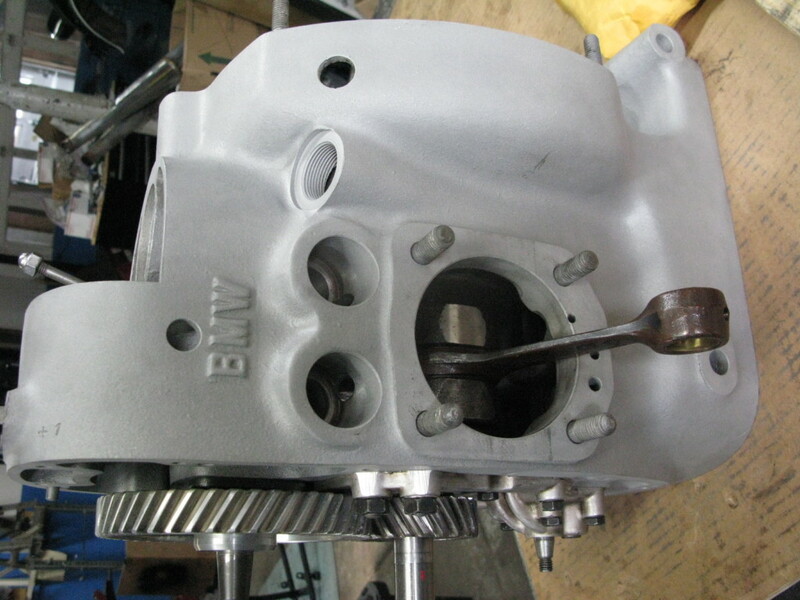 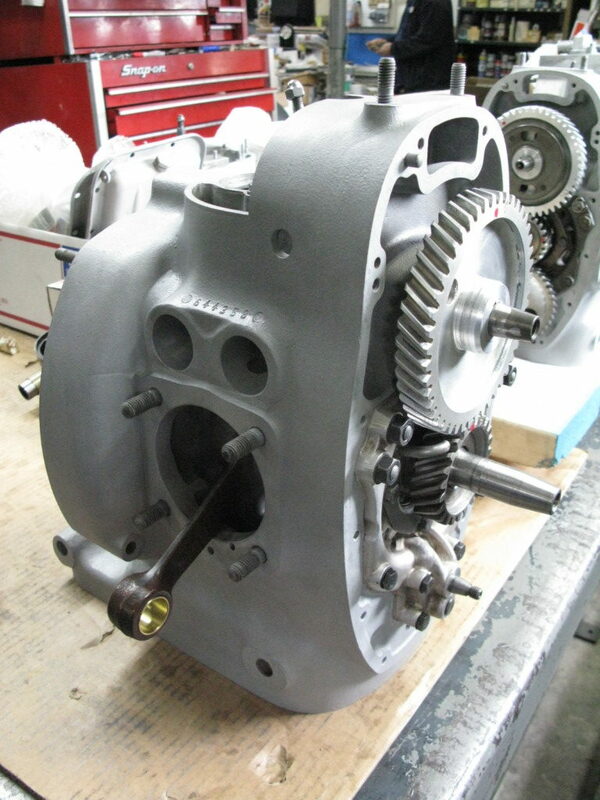 The Motor and transmission were torn down, the cases media blasted and the complete rebuild began. 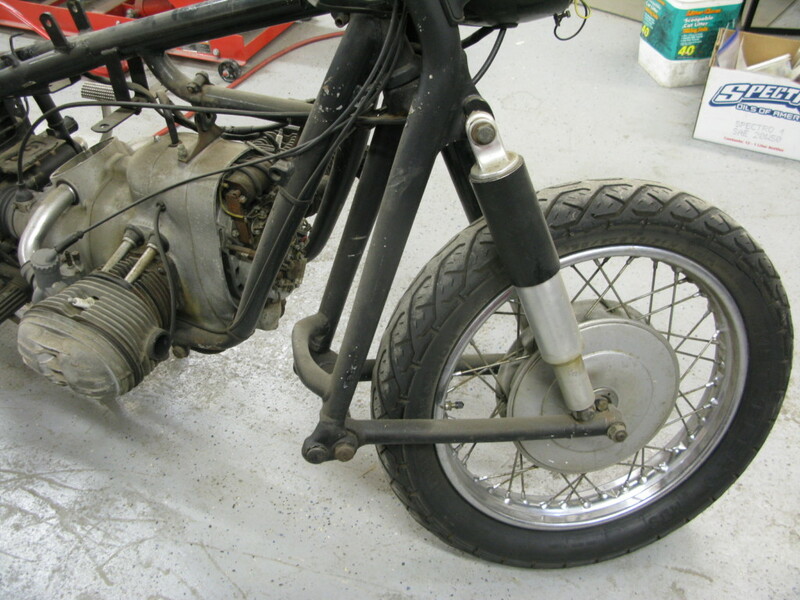 I worked on the running gear, the frame, shocks, swing arms wheels etc. 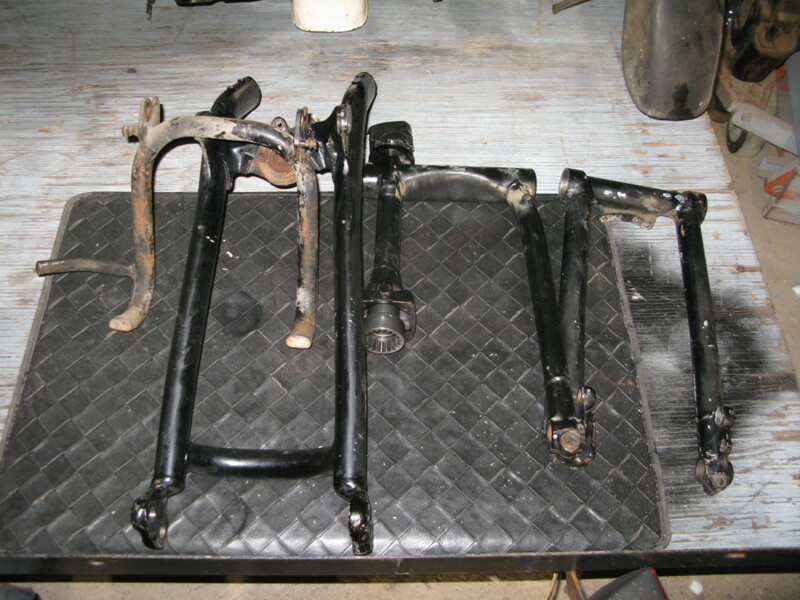 the frame and swing arms went out to powder coat, chrome and polish to the person who does our chrome and fenders, tank and other painted parts off to the painter. 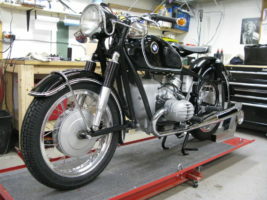 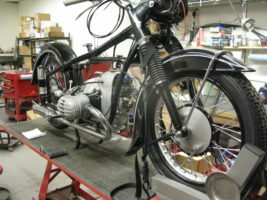 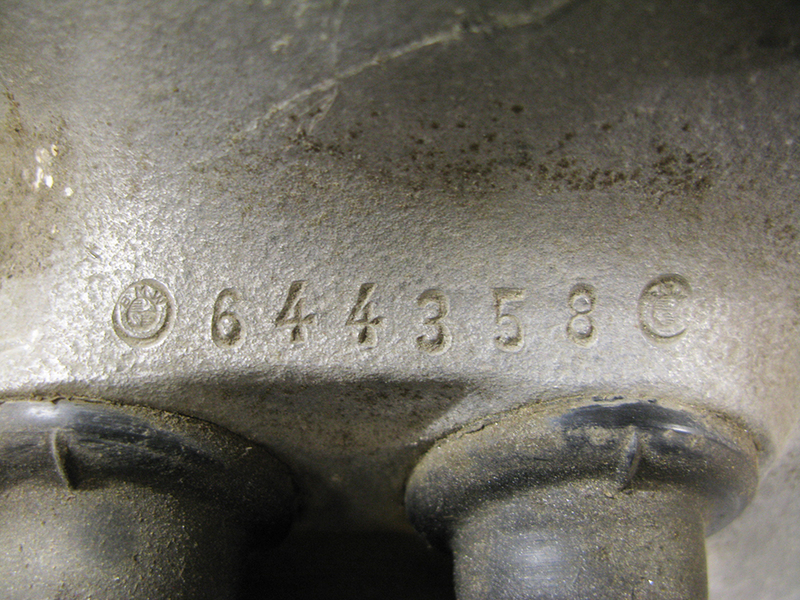 Parts were ordered from both Europe and the United States to get the project on track to be finished in time for spring. 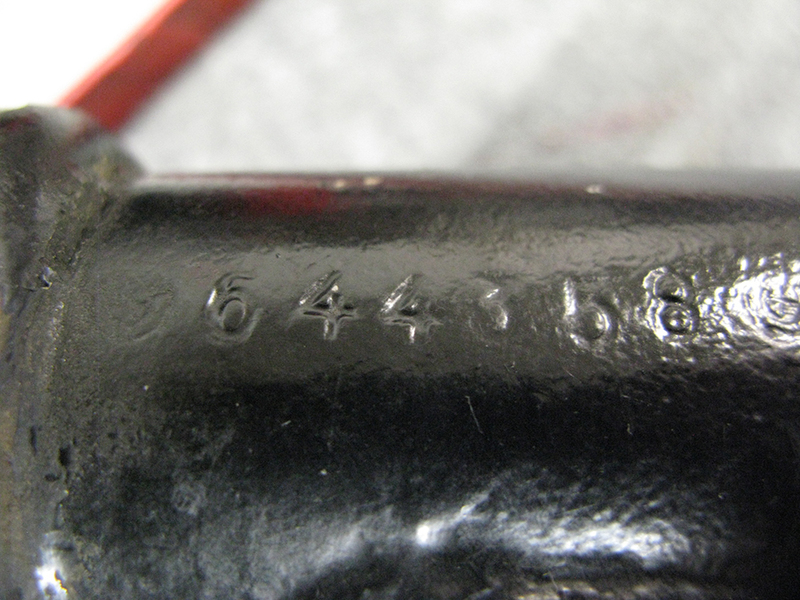 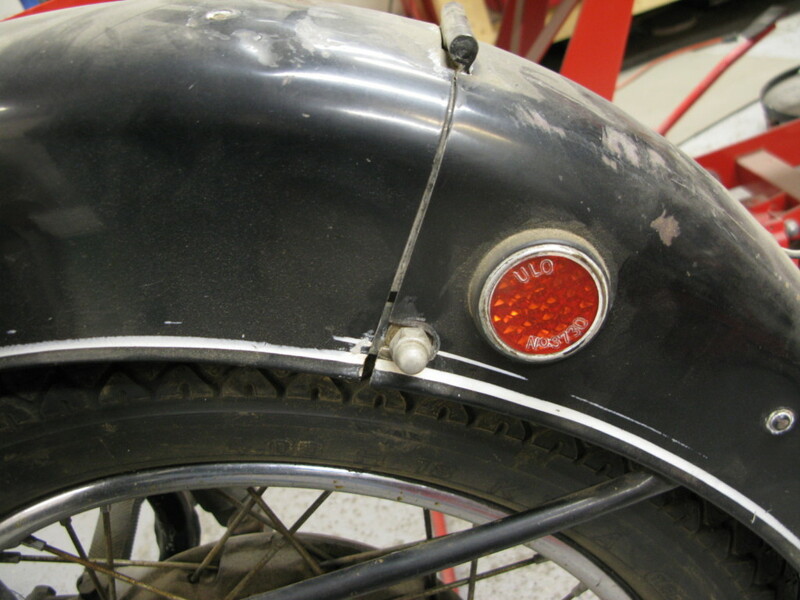 The decision to paint traditional Auvis black with white pin stripes was made and the project was well underway. 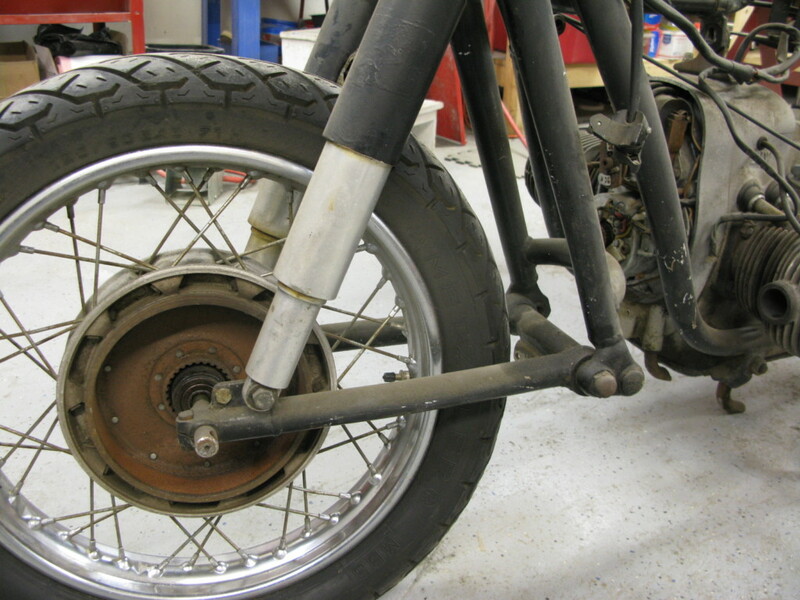 New bearings, seals and gaskets were purchased for every part of the bike from engine to swing arms. 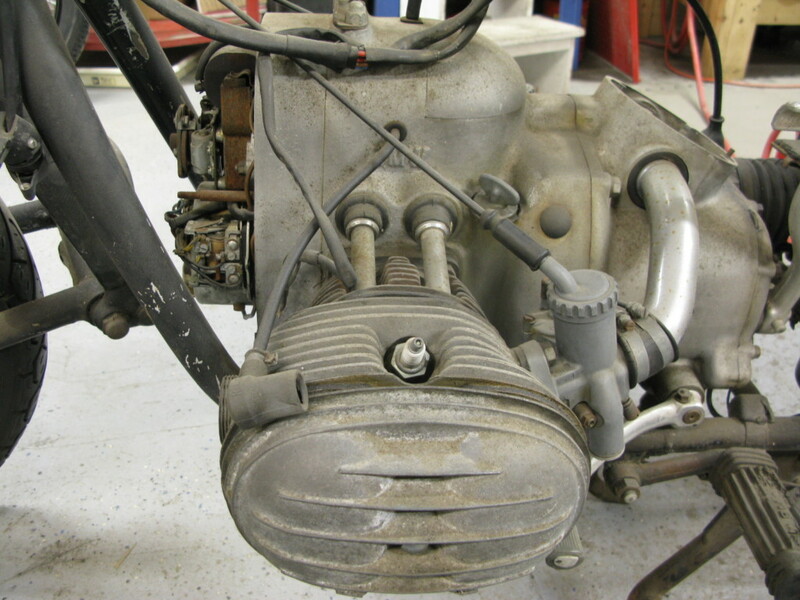 the carburetors were totally dismantled, solvent cleaned and the bodies media blasted with 9 mil glass bead to make them look like new. 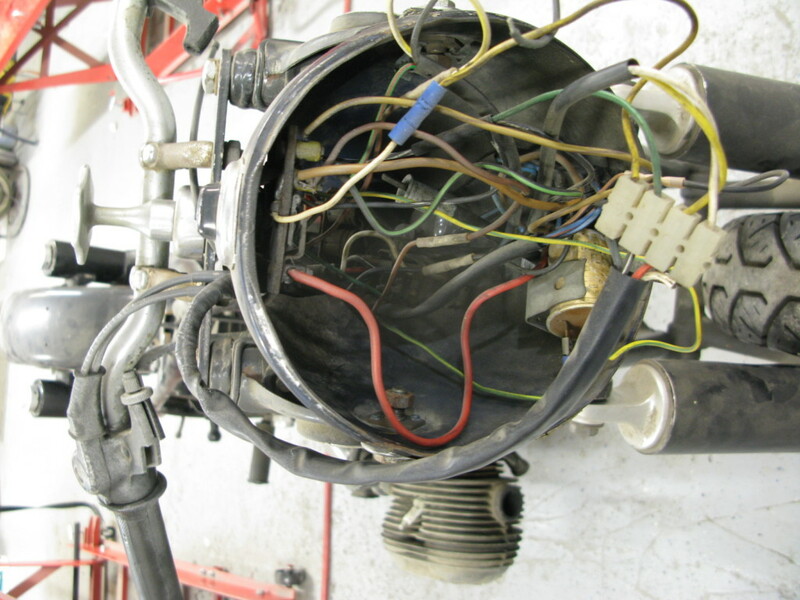 All new jets, needles and gaskets used to complete the rebuild. 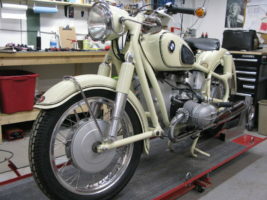 Wheels were dismantled, new chrome rims purchased from Germany with new stainless steel spokes. 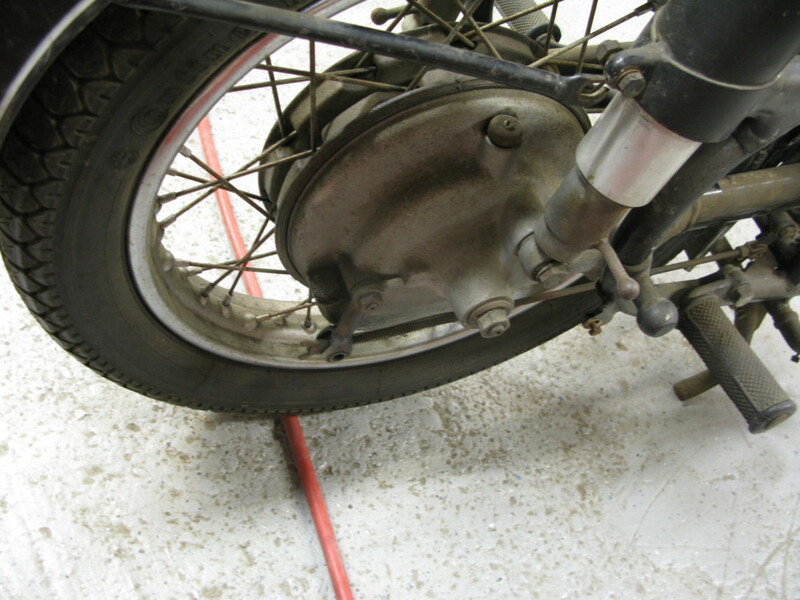 Old wheel bearings removed, hubs media blasted and coated with Eastwood Satin Clear coat to prevent oxidation, new wheel bearings installed with proper pre-load. 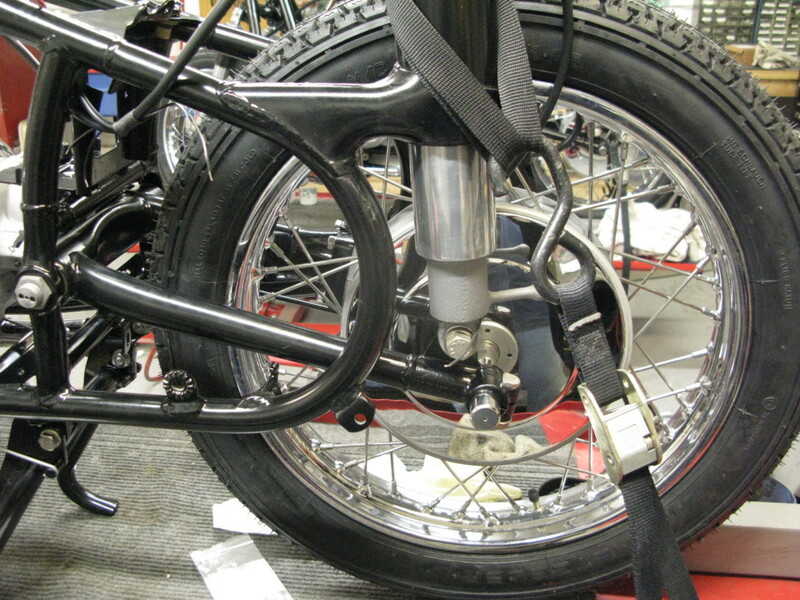 Wheels laced to new rims, trued and balanced and a new pair of Metzler 350×18 tires installed with chrome hubcaps. 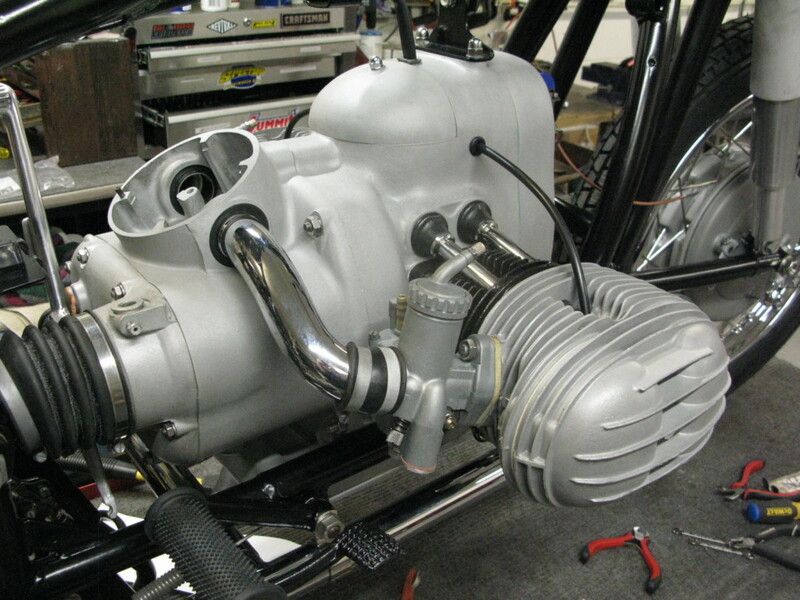 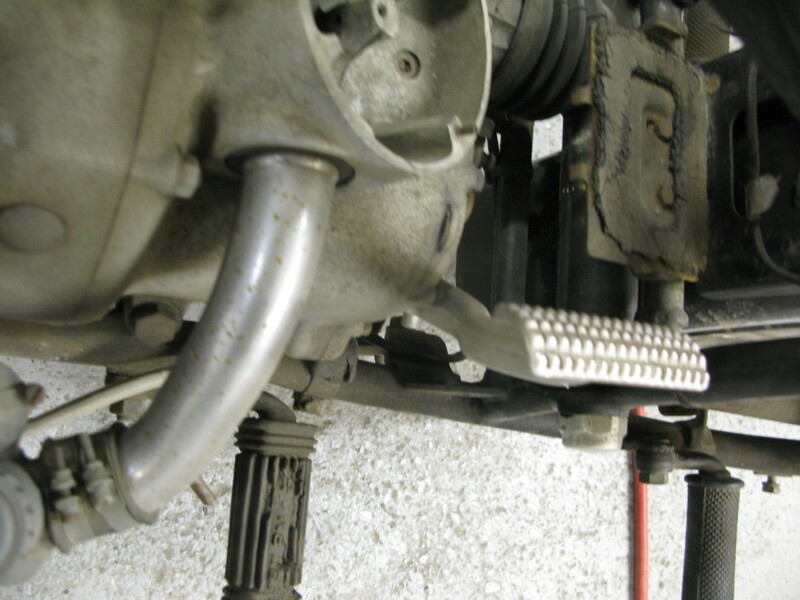 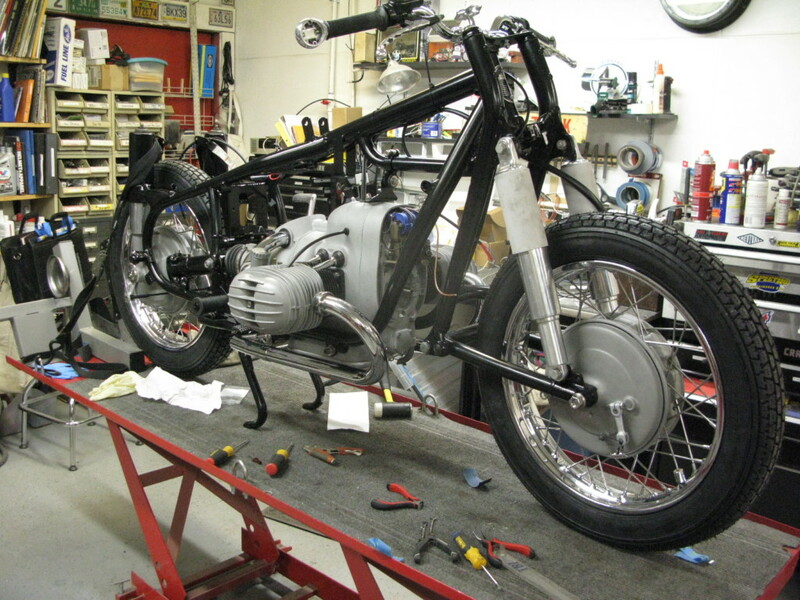 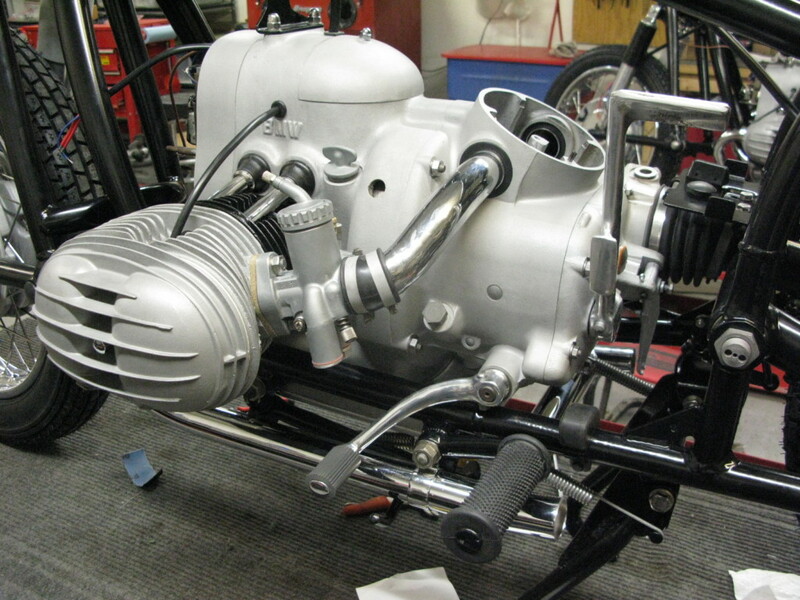 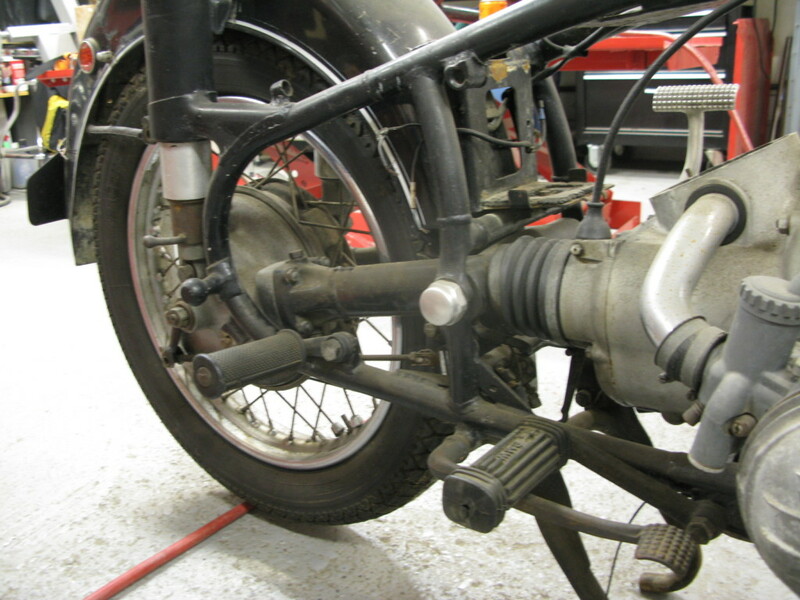 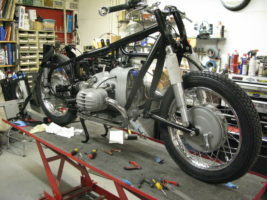 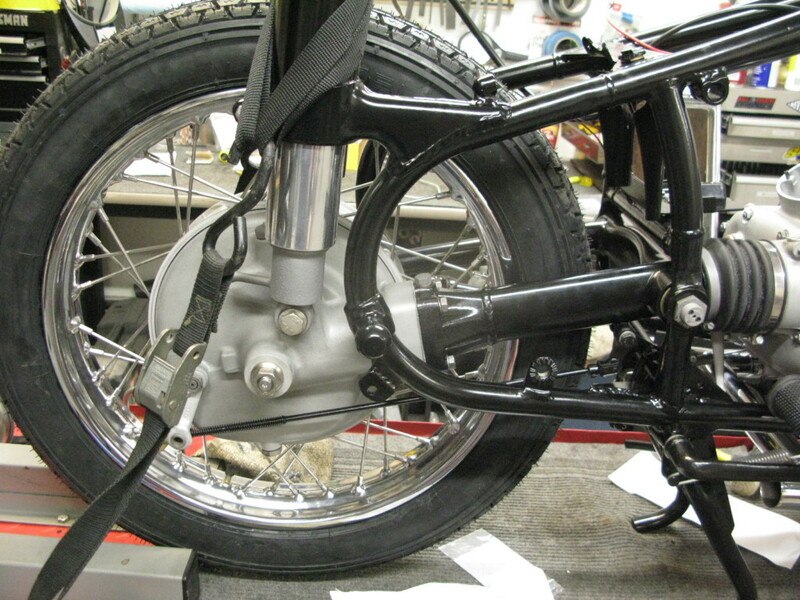 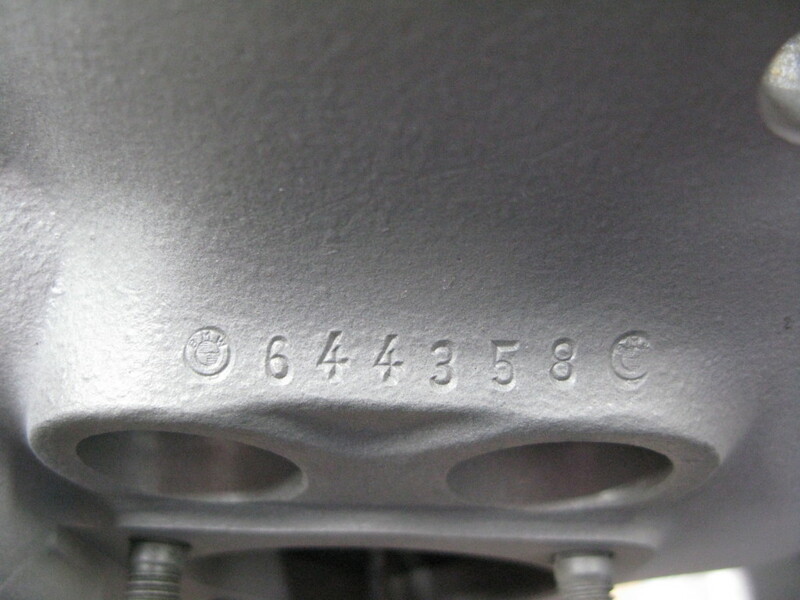 On April 1 the engine, transmission and final drive was installed in the frame and a rolling chassis created. 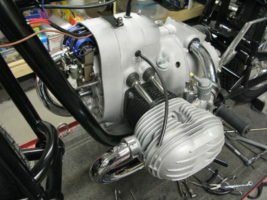 a 12 volt charging system has been purchased and will be installed with a totally re-built magneto. 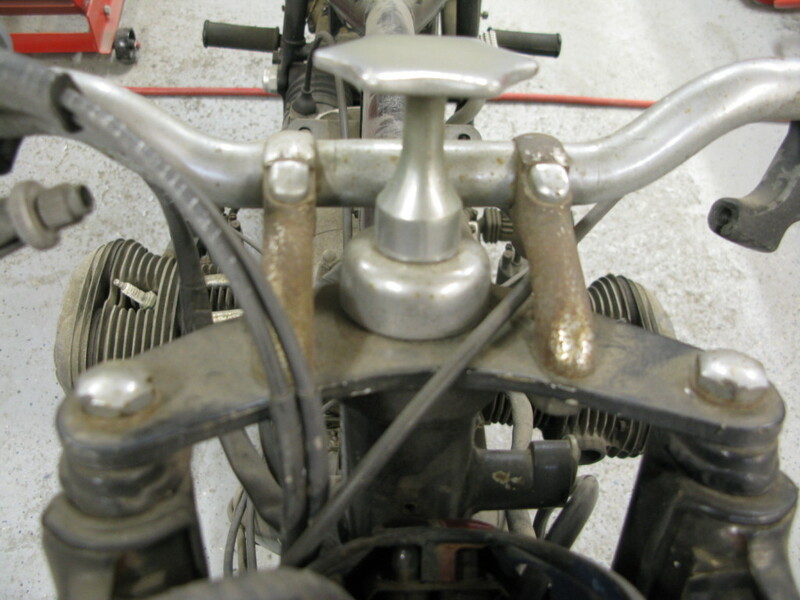 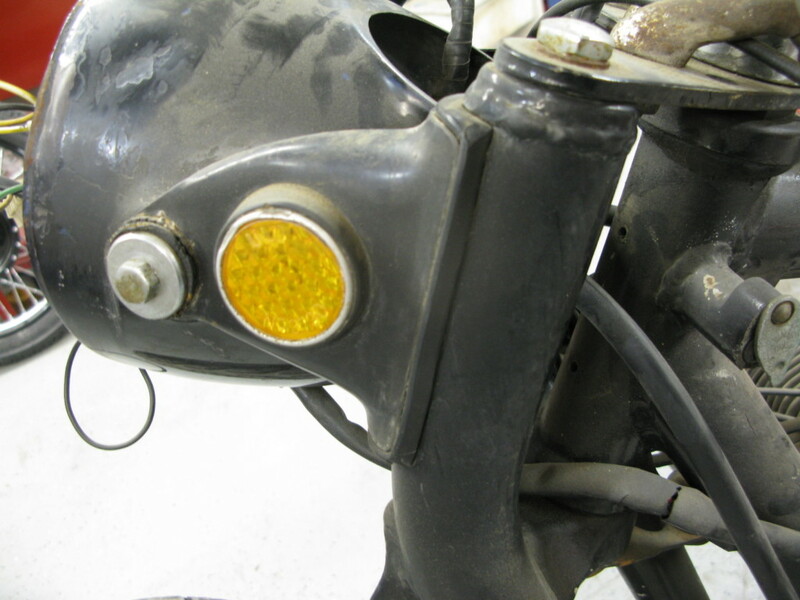 New wiring harness and handlebar control switches will be finished as soon as we get the painted headlight bucket. 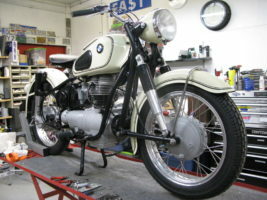 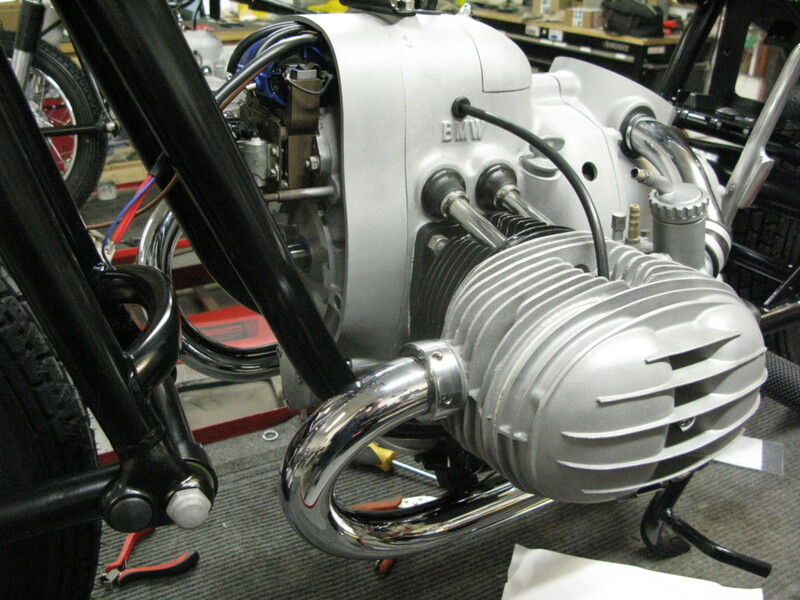 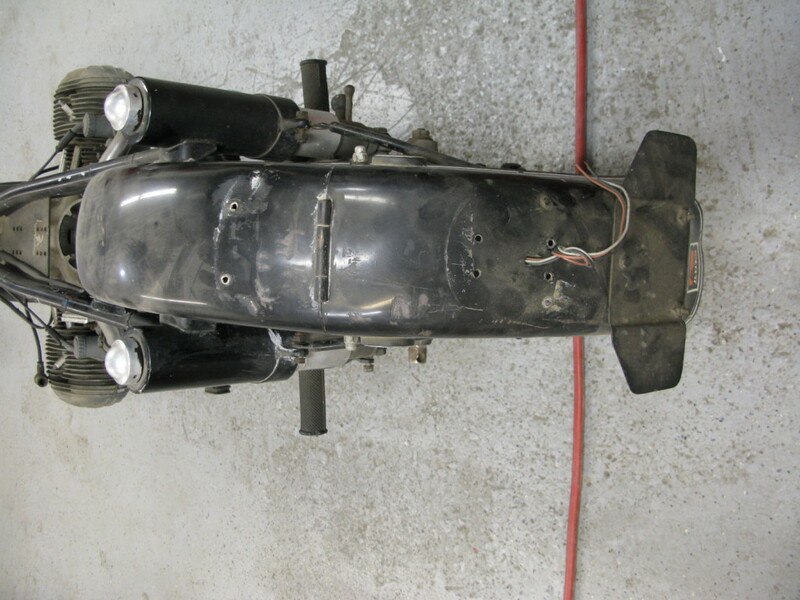 the project is moving along well and we hope to have the bike out by the end of April for sale..